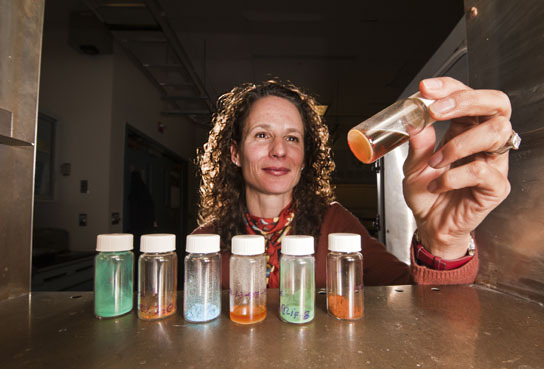 Sandia chemist Tina Nenoff heads a team of researchers focused on removal of radioactive iodine from spent nuclear fuel. They identified a metal-organic framework that captures and holds the volatile gas, a discovery that could be used for nuclear fuel reprocessing and other applications. A research team, comprised of Sandia chemists, is researching ways to make nuclear fuel reprocessing cleaner and to reduce the volume of high-level wastes. By focusing on the radioactive components that can’t be burned as fuel, the goal is to find a methodology for highly selective separations. By using metal-organic frameworks (MOFs), they are able to capture and remove volatile radioactive gas from spent nuclear fuel. ALBUQUERQUE, N.M. – Research by a team of Sandia chemists could impact worldwide efforts to produce clean, safe nuclear energy and reduce radioactive waste. Sandia chemist Tina Nenoff heads a team of researchers focused on removal of radioactive iodine from spent nuclear fuel. They identified a metal-organic framework that captures and holds the volatile gas, a discovery that could be used for nuclear fuel reprocessing and other applications. (Photo by Randy Montoya) Click on the thumbnail for a high-resolution image. The Sandia researchers have used metal-organic frameworks (MOFs) to capture and remove volatile radioactive gas from spent nuclear fuel. “This is one of the first attempts to use a MOF for iodine capture,” said chemist Tina Nenoff of Sandia’s Surface and Interface Sciences Department. The process also reduces the volume of high-level wastes, a key concern of the Sandia researchers. “The goal is to find a methodology for highly selective separations that result in less waste being interred,” Nenoff said. Part of the challenge of reprocessing is to separate and isolate radioactive components that can’t be burned as fuel. The Sandia team focused on removing iodine, whose isotopes have a half-life of 16 million years, from spent fuel. “We investigated the structural properties on how they work and translated that into new and improved materials,” Nenoff said. 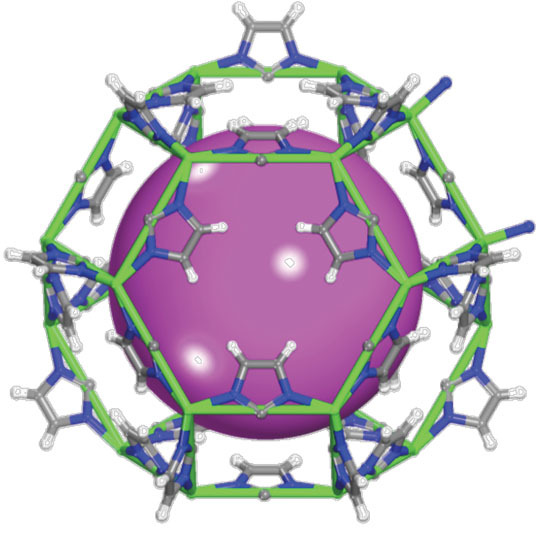 The trick was to find a MOF highly selective for iodine. The Sandia researchers took the best elements of the zeolite Mordenite — its pores, high surface area, stability and chemical absorption — and identified a MOF that can separate one molecule, in this case iodine, from a stream of molecules. The MOF and pore-trapped iodine gas can then be incorporated into glass waste for long-term storage. This illustration of a metal-organic framework, or MOF, shows the metal center bound to organic molecules. Each MOF has a specific framework determined by the choice of metal and organic. Sandia chemists identified a MOF whose pore size and high surface area can separate and trap radioactive iodine molecules from a stream of spent nuclear fuel. The Sandia researchers are part of the Off-Gas Sigma Team, which is led by Oak Ridge National Laboratory and studies waste-form capture of volatile gasses associated with nuclear fuel reprocessing. Other team members — Pacific Northwest, Argonne and Idaho national laboratories — are studying other volatile gases such as krypton, tritium and carbon. Sandia’s iodine and MOFs research was featured in two recent articles in the Journal of the American Chemical Society authored by Nenoff and team members Dorina Sava, Mark Rodriguez, Jeffery Greathouse, Paul Crozier, Terry Garino, David Rademacher, Ben Cipiti, Haiqing Liu, Greg Halder, Peter Chupas, and Karena Chapman. Chupas, Halder and Chapman are from Argonne. “The most important thing we did was introduce a new class of materials to nuclear waste remediation,” said Sava, postdoctoral appointee on the project. Nenoff said another recent paper in Industrial & Engineering Chemistry Research shows a one-step process that incorporates MOFs with iodine in a low-temperature, glass waste form. “We have a volatile off-gas capture using a MOF and we have a durable waste form,” Nenoff said. “We’ve shown that MOFs have the capacity to capture and, more importantly, retain many times more iodine than current materials technologies,” said Argonne’s Chapman. 2 Comments on "Sandia Chemists Use MOFs to Remove Radioactive Gas from Nuclear Fuel"
Hi, Neat post. There’s a problem along with your site in web explorer, might check this? IE nonetheless is the market leader and a huge element of other people will omit your excellent writing due to this problem. Thanks, we will take a look ASAP.